This is a crafting mod for Adventure Mode that replaces workshop requirements with civilian profession-specific tools and adds intermediate stages into the crafting process. 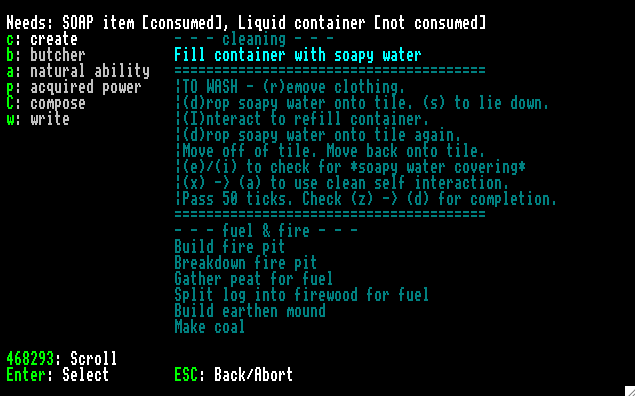 There is an emphasis on general quality of life features where consuming cooked food or soap usage will provide good thoughts, and more specific to slow/local travel game-play, providing methods of managing encumbrance, such as being able to dry meat. The whole of the readme.txt is included at the end of this post. If something is unclear, please ask and I'll do my best to respond. All comments and suggestions welcome. This mod owes much of its general framework to both Deon's DF Wanderer and Random_Dragon's Adventurecraft; its coffee and tea structure to Button's post in her topic Brainstorm: Hard Brewing Mod; its thinking on tick changes for polearm speed to Grimlocke's History & Realism Mods; and its ideas on weapon sets for ranged units to Sver's DF Combat Reworked. Belatedly listed here are some of the off-Bay12 sources that P&F learnt from. Archery (bow/crossbow making) drew from a variety of sources. 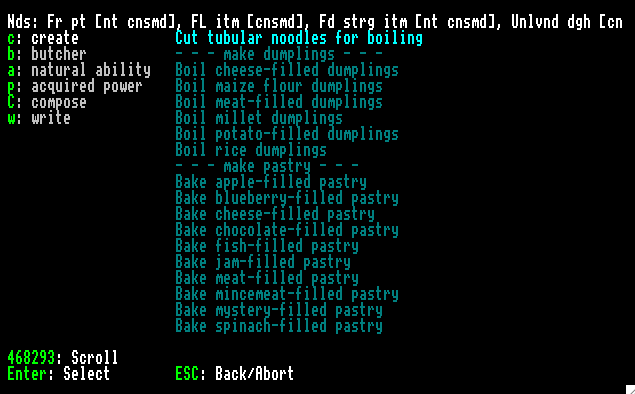 Cooking peeked into A Boke of Gode Cookery, though much of what I added is anachronistic and culturally eclectic. All things woodcutting and shield-making came from Hurstwic. Mail construction came from MyArmoury's Mail: Unchained and article 10 The manufacture of chain-mail – Arne Jouttijärvi from Erik Schimd's mail article archive. 01.15.2017 - Bug fix: Stacking Reaction - wasn't accepting plant growth. Item token edited. 01.15.2017 - Bug fix: Crossbow prod Reaction - product referred to wrong reagent. Corrected. 01.16.2017 - Quality of Life Issue: Leatherworker Reaction - replaced the generic edge tool requirement with shears. 01.18.2017 - Bug fix: Club entry in item_weapon_advmd.txt. Size changed from 9000 to 800. The before size was based on making a wood club weigh close to a metal mace. 01.18.2017 - Fixed the bug fix: clubs reverted back to wood and 9K size - wood weapons token added to entity for subterranean animal peoples. No world issues from change! 01.20.2017 - Bug fix: Reactions for quicklime, soapmaking and parchment suffer from a known Adventure Mode bug where products in containers are not recognized. This has been fixed/given a workaround. The Readme.txt has been updated to reflect this change. 01.21.2017 - Added reaction(s) to Adventure Menu - create backstrap loom and cloth creation. It's for light travel. A shopkeeper might use the heavy warp-weighted loom, but not the ranger. 01.21.2017 - Added reaction(s) to Bonecarver Menu - ability to carve crafts out of horn and tooth. 01.21.2017 - Entity change - daggers added to all entities. This way you can find daggers of different metal types as not everyone wants to forge. 02.05.2017 - Bug fix: Bonecarving Reactions for totem, horn/antler helm, and tooth helm - problematic reagent allowed for any corpse piece. Changed to specifically bone. 02.05.2017 - Quality of Life Issue: padded helm/coat token changed to STRUCTURAL_ELASTICITY_WOVEN_THREAD. Prior to those, plant fiber items did not suffer wear when hit by edged weapons. 02.05.2017 - Quality of Life Issue: cartilage now edible. 02.12.2017 - Stacking Cleanup: (1) Noticed the stacking reaction for seeds did not and cannot work. While most of us have seen stacks of nuts (which are considered seeds), seeds don't stack. (2) The stacking reaction for fish is unneeded in Adventure Mode as the stacking reaction for meat covers this. Both have been removed. 02.12.2017 - Vanilla crafts from Bonecarver were added to Stonecrafter and Woodcrafter. Not everyone wants to make amulets and rings from bone. 02.12.2017 - Woodcrafters can make shears, allowing for a more vegan experience as some pacifist players may even wish to shun metal crafting. 02.12.2017 - Ability for bonecarvers and woodcrafters to make blowguns and darts. 02.12.2017 - New props added: spoons (can hold 1 unit of liquid), small bowls, pans, smaller pot. They don't have any true utility, but they might enhance the travel experience. 02.12.2017 - Wooden backpacks added. 02.21.2017 - Bug fix: Clothier Wool reaction edits to shoes, and bags. The shoe reaction referred to the wrong reagent, and the bag reaction had the typo "yarm". All good now. 04.02.2017 - Fuel revamp. 3 fuels, all interchangeable. 04.02.2017 - Kettles added in. May populate meadhalls, camps. Can craft them out of metal, stone, or clay. Liquid container for making tea or coffee. - flails from MACE to PROCESSPLANTS (entities that have FLAIL will show thresher as a possible skill when creating character. Results in recruit with copper spear/dagger). For those who dislike this, just revert the skill to its original setting. 04.02.2017 - Bug fix to headscarves. Product was creating coifs. 04.02.2017 - As per Ziusudra's recommendation, readme updated with new reagent info for rock/soil, and also plants/plant growth, and vermin fish. 04.04.2017 - Bug fix to mail coifs. Product was randomly making a helm or cap. 04.04.2017 - Bug fix to silk thongs. Reagent now ANY_SILK_MATERIAL. 04.07.2017 - Bug fix to querns. 04.07.2017 - Changed the twine making reaction to "make twine from any plant growth". 04.07.2017 - Grower reaction removed. 04.07.2017 - Pearlash removed from green glass reactions Produce table/cabinet. 04.08.2017 - Bug fix to cooking. 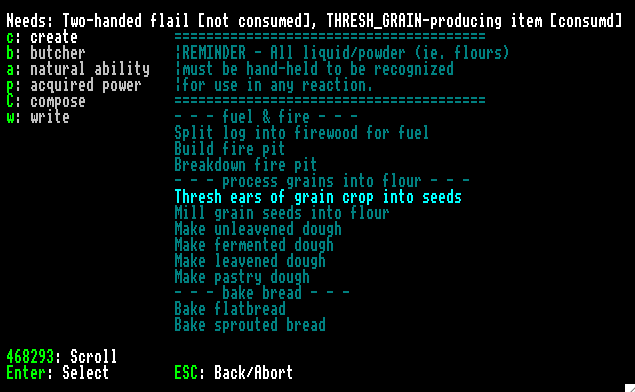 Roasted items were not producing ash as intended, nor were reagents being depleted. Removed the % chance of getting your skewer back for the fix. All working now. 04.08.2017 - Meat and fish boost toughness now as the buff to strength produced a speed drop. 04.09.2017 - Meat and fish changed to boost endurance now as the buff to toughness while functional didn't make too much sense. 04.18.2017 - Bug fix to stone meat cleaver reaction in stonecrafter menu. Product was incorrectly referring to reagent wedge. Changed to stone. 04.19.2017 - Bug fix to boiled/stewed reactions. They were not producing ash as intended, nor were reagents being depleted, due to a what would appear to be a container issue/bug. All working now. 04.19.2017 - Removed physical/mental attribute buffs from food and drink as they were causing a small speed drop. For some, that sort of 10 point drop might be insignificant, but 10 points can be the difference between a 3.0 sprint and a 2.990 sprint for all you Dragonfallers. 04.30.2017 - Boiled food reactions simplified. They no longer need bones. New generic broth type added. 04.30.2017 - Bug fix to bone broth reaction. Had that lingering ash/reagent issue. Numbers tweaked from 6/4 to 9/1 bone broth to gelatin. 04.30.2017 - Flavor text change to fried meat chop and roasted meat chop. 04.30.2017 - Fire pits and earth ovens can now be reverted to their constituent parts. 04.30.2017 - Javelins added as alternate SPEAR weapon. 04.30.2017 - Hafts had previously been indestructible. Changed made so this is no longer the case by adding a prepare & recover. 04.30.2017 - Wooden masks can be crafted in the woodcrafter's menu. 05.25.2017 - Bugfix to stone axes. Reverted the skill back to AXE as chopping down trees is linked to that skill. Who knows why I did such a silly thing? 06.25.2017 - Miner reaction added. Rock blocks and salt "blocks" require a pick to mine. Rock blocks require a metal pick, but salt "blocks" allow for any pick type. Stone picks can be crafted under the stonecrafter's menu. 06.25.2017 - Salt is introduced. Under the cook and miner menus, it can be "mined" off rock salt pebbles as "blocks" (% chance of making a salt block, % chance of just getting 1 use powder), or found as a soil in some deserts. Each salt "block" is worth 75 value and can be ground either into coarse ground salt with 50 unit use (PRODUCT_DIMENSION:50), also a 75 value, or into 25 salt "coins" each worth 3 value. As these aren't true coins they can't be stacked. Each salt coin can be crushed into salt, with 2 unit use (PRODUCT_DIMENSION:2). 06.25.2017 - Expanded cooking reactions as a result of salt. Several types of vinegar were added and a fair portion of recipes were made ingredient specific. 06.25.2017 - Expanded tea reactions. After reading through a few forum threads where Button pointed out distinctions between what constitutes tea versus herbal tea. Tea leaves can be processed into green, white, black and fermented teas. 3 of the 4 have both a brick form as well as a loose form. Bricks have higher value (70f, 60b, 50g) than loose tea (all 40). 06.25.2017 - Tweaked coffee to somewhat mimic tea. Mounds of any type coffee bean have a 50 value, and 50 unit use (PRODUCT_DIMENSION:50). 06.25.2017 - Added 2 types of jars. Standard size can store 5 solid units, large 20 units. Jars can be made from stone, clay, glass and metal. 06.25.2017 - Overhauled shields. There are still the metal, bone and plant material shields. The new addition is leather shields, mainly for that special time when a titan or forgotten beast yields a skin. 06.25.2017 - Added stone anvils. Anvils now required for metalsmithing reactions. You can make the initial anvil from stone under the mason's menu. 06.25.2017 - Tridents added to train fishing skill. Not all that different from the pick wielding "miner" who's never interacted with rock. 06.25.2017 - Added in adamantine's Tolkienish doppelgaenger, mithril. 06.25.2017 - Added "locked chests", a tool item, which may occasionally populate mead halls/camps/tombs. Like all tool items, somewhat rare, with potentially a less than Monty Haul rare drops @2% likelihood. We should all blame Bilbo for this. 06.27.2017 - Bug fix to forging. Forging-realted globs there were missing the METAL_ITEM_MATERIAL token. It's been fixed. 06.27.2017 - Bug fix to bowyering. In the switch from thread to twine use, some products still referred to thread. Fixed as well. 06.27.2017 - Tinkered with values for cooked food like stews and salted meats just so they have decent value. 06.28.2017 - Had to tinker with salt as not all REACTION_CLASS:SALT items were registering properly. Salt, whether 50 use or 1 use is now a powder. Hills of salt replaced with coarse ground salt. 06.30.2017 - Noticed something was off with peat clumps. They are REACTION_CLASS:FUEL, but this was not being recognized. Fixed the peat clump reactions in both farmer & adventurer's menu so they work again. 07.15.2017 - Trying to make slow travel lighter, easier, and faster. No world regen necessary. 07.07.2017 - Tweaked numbers for cooking. Some things needed batches. Why do a reaction more times when you could do it less? 07.07.2017 - Replaced the 20 use GLOB item "pile of salted meat" with a single use GLOB item called "salted meat." 20 units of whatever animal meat weigh 42r. Once salted, this becomes 20 units of salted meat at a weight of 12r. 12r is still heavy, of course. 07.07.2017 - Side of bacon went from being a 20 use GLOB item to a 5 use GLOB item. When you cook bacon you'll get 4 fried bacon. Before you'd only get 1 and you'd need to cook 20 times to deplete the side. I think this makes cooking while traveling less of a pain. 07.07.2017 - Some reactions like boiled meat which used to require a 1:1 are now 4:4. The ingredient specific recipes went from a 4 item product to 8. Same benefits as bacon. 07.15.2017 - Bugfix to salted meat. Reaction was only making 1 salted meat when it should have been making 20. Sorry about that. 09.08.2017 - Removed METAL_ITEM_MATERIAL from mining reactions. You can now use stone picks for everything. 09.08.2017 - Given the good suggestion by Mathel, switched the requirement for a pair of leather gloves for all metal and glass reactions to requiring just a single non-specific item of leather material. This also affects arrow and bolt crafting as well as smelting. 09.14.2017 - Swapped out LIQUID_MISC for GLOB in smelting reaction. Ease of use > flavor. 09.14.2017 - Bugfix to forging furniture reaction. It'll now ask for the blast furnace. 06.24.2018 - Birds (at/around 1000 size) such as ducks, keas(! ), & whatnot were increased to 1700 size and made butcherable. They will drop an appropriate material feather. These non-giant bird flocks have gameskeeper value. 06.24.2018 - Any creature w/ an insulation token will drop fur, if it's large enough. Being able to drop fur makes trapping kind of a thing your character can do now. 06.24.2018 - Fletchings for metal, stone and bone missiles are now made from feathers. Plant based fletchings were kept and relocated to the woodcrafter's menu for use with wooden missiles as a vegetarian-oriented characters may wish to opt out of omnivorous ranged-weapon gameplay. 06.24.2018 - Changed MAX_EDGE on wood from the vanilla DF default 1k to 5k, and bone & stone from the vanilla DF default 1k to 7.5k. Subterranean animal people will be enjoy a slight buff as they use wood, and outsiders can Princess Mononoke with better success if they want to shed their starting copper for a more primitive setup. Naturally, archer-rangers can, in many, cases skip metal arrows/bolts to local-travel lighter and produce more edged damage deaths when hunting the wilds. 06.24.2018 - Renamed the default vanilla bow to "war bow" for differentiation, as I added in a tool called a "hunting bow" which is a bit weaker and will train observer, a non-unit changing combat skill. Any civvies you've armed with a hunting bow stay civilian—I'd rather keep my recruited hunter as a hunter, not a bowman. 06.24.2018 - Added another launcher variant: the sling. It can be crafted under the clothesmaking (plant & wool) or leatherworker menus. Ammo is crafted under stonecrafter's. Will train thrower, a non-unit changing combat skill. It has an upgrade called the staff sling which can be constructed under the woodcrafter's menu. 06.24.2018 - Added bread, dumplings and pies to the cooking menu. Comes in both meat-filled and plant-based varieties. Not all plants can be ground to flour. 06.24.2018 - Added facial hair to outsiders: dwarf, elf, goblin & human outsider males now have description-visible sideburns, mustaches, and beards. 06.24.2018 - Added more diversity to pick material as bonecarvers can make bone picks. 06.24.2018 - Added girdles. Offers lower body coverage and little else. Only has armor levels if leather, padded, or metal. Otherwise, it's just a bellyband. 06.24.2018 - Made dark & mountain gnomes playable as outsiders. 06.24.2018 - Added halflings. 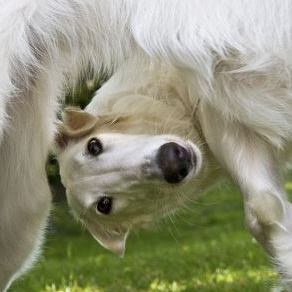 They're as agile as elves and kobolds and @30K size may have Small Profiles when standing for Visual Stealth. Usable in Adventure Mode as outsiders. 06.30.2018 - Generic plant salad, soup (stock), and stew added. 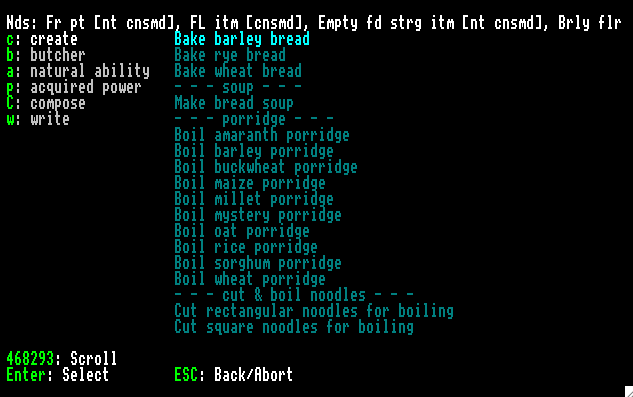 08.28.2018 - Food/cooking overhaul, soap usage in Adventure Mode, weapon sets for ranged units, and improved fuel simulation. Please see this post for details. 08.28.2018 - Dropped the solid density for CHEESE from 1200 to 300 as cheese weight for 1 unit was too high. You can now carry more cheese. 08.28.2018 - Gemcutting/setting. Mining lets you occasionally (2-4%) find roughs. Roughs are limited to stone that can appear anywhere. Under gemcutting/setting, these can be cut into small/large gems and used to decorate weapons and jewelry. 08.28.2018 - Elves farm, meaning forest retreat taverns will have drinks. 08.28.2018 - Elf civilians may spawn with broom, rake, or haft. 08.28.2018 - Goblins are born and age. They also eat and sleep. 08.28.2018 - Humans have outdoor orchards. 08.28.2018 - Mauls train wood burning. Hammer units will only spawn with war hammers. 08.28.2018 - Hafted weapons gain a "safe" shove/crosscheck attack to cause yielding. 08.28.2018 - Renamed weapon "great axe" as "large axe" (SKILL:AXE = tree cutting). 08.28.2018 - Removed occurrence of metal missile launchers, due to adding in weapon sets. Separate wooden bows and crossbows can be found in item stashes. 08.28.2018 - Removed differentiation between bows (hunting or war). 08.28.2018 - Removed whips. Lashers can now flog away with two types of 10 contact area flails. 08.28.2018 - Removed girdles. Had been cluttering up and hodgepodging NPC armor slots. 08.28.2018 - Reading reaction added to Adventurer menu. 08.28.2018 - Various types of wood work produces debris. 09.07.2018 - Some cooking reactions were not depleting reagents, because the amount produced exceeded the container capacity. In this case pots do not like product amounts over 10, despite being able to carry 16 units of water. The result was only one unit of product (flatbreads) and no ember creation. This has been fixed. 09.07.2018 - Bread soup reaction wasn't recognizing BRINE reaction class. Has been fixed. 09.07.2018 - Raw meat and innards may cause illness if not cooked. 09.09.2018 - Fill container with soapy water reaction was looking for TOOL_USE:LIQUID_CONTAINER, when this token shouldn't have been there >_>. That's been remedied. The only 2 tokens needed provide the requirement that you have an EMPTY, DOES_NOT_ABSORB item. 12.20.2018 - Armor crafting given added crafting detail. Armor resizing and repair made less monty haul. 12.20.2018 - Simplified naming for swords. Flattened description for more varied roleplay. Numbers have not changed. 12.20.2018 - Reverted all axes to axe skill. Makes tree cutting less confusing. Weapon sets differ though, as they are recognized first as ranged weapons, to which DF does not assign tree cutting ability. 12.14.2018 - Elves given LOW_LIGHT_VISION:10000 because this is one of the most significant factors for anyone playing a ranged weapons character. Oddly enough, for vanilla DF, dwarves make the best archers at anytime of day, under any weather conditions due to 10K low light vision. 12.20.2018 - Added outsider controllable half-elves. Like halflings, they do not appear in the wild. 12.20.2018 - Added outsider controllable centaurs. Bundled version only as outsider controllable. 12.20.2018 - Added sealed barrels. They can be opened using the Adventurer reaction menu and are found at world gen forts and perhaps(?) some bandit camps. Care packages from your dwarven grandma. All sealed barrels guarantee one hand axe, components for a single crossbow and for armor resizing/repair, along with sundry quality of life items. Unlikely, but some barrels have a chance of shinyness. 12.20.2018 - Updated locked chests to only appear in meadhalls and perhaps(?) some bandit camps. Where sealed barrels are about foodstuffs, chests are about senseless treasure. As in previous versions of P&F, unlikely, but a chance of shinyness. 01.06.2019 - Farmer reaction fix: make soap from rendered animal fat wasn't recognizing lye. 01.06.2019 - Stonecrafter reaction fix: chip stone into 10 arrowheads had copy/paste error. 01.06.2019 - Removed embers as byproduct of fuel use reactions. didn't benefit simulation as much as it caused issues with liquids. 01.07.2019 - Farmer reaction fix 2nd try: make soap from rendered animal fat wasn't recognizing lye. 01.07.2019 - Cleaning interaction edited to prevent accidental drinking of liquid/powders. 01.11.2019 - Material template edit to innards. Cooking reaction was not recognizing innards as meat. Has been fixed. 01.11.2019 - Weapon set reaction edit. Entry for mauls referred to axes. Has been fixed. 01.11.2019 - Edit to Bonecarver. Bone blowgun entry changed to bows made from horn/antler. 02.16.2019 - Edit to meat-based foodstuffs cooking reaction. 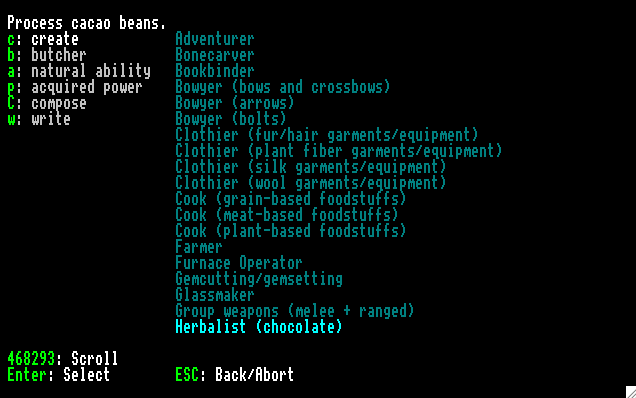 Having hunted a small critter in my adventure mode run, I realized the reaction for dried meat (which helps in cutting encumbrance) should ask for 5 units of meat and not 20. 02.16.2019 - Edit to weapon set grouping reaction. Reactions were not recognizing missile weapon. 02.16.2019 - Edit to natural attack tackle. Removed skill associated so it only trains MELEE_COMBAT (fighter skill) once. 03.01.2019 - Reduced item sprawl and simplified pairings for NPC ranged units. Added ability to un-pair weapon sets. See this post. 03.01.2019 - Whips added back. 03.01.2019 - Flails train mace again. 03.15.2019 - Arrows/bolt crafting simplified. 03.15.2019 - The Easy Start Guide to Arrows/Bolts edited to reflect change. Note: for those who have added files from the Animal Pack and/or the Unusual Critter Pack, be sure to re-add those files to your copied-over objects folder *if the update required no new world gen*. Installation: Drop the objects folder into your raw folder. You'll need to generate a new world to activate the reactions. Installation: Drop the 10 txt files into your objects folder. You'll need to generate a new world. 12.20.2018 - Added roaming NPC golems (meat, mud, clay, and plant). Noticeable by odor. Melee Skill 3. 12.20.2018 - Added outsider NPC centaurs. Are benign. 12.20.2018 - Added NPC iron bulls. Are megabeasts. Similar to bronze colossus, with no skill levels. 12.20.2018 - Added NPC clockwork seraphs. Are benign. Equivalent to demon in level. Installation: Drop the 7 txt files into your objects folder. You'll need to generate a new world. Drag and drop the objects folder onto your raw folder in order to copy over the original. You'll need to generate a new world to activate the reactions. In Adventure Mode, when crafting, the game only recognizes ingredients/items if they are either on the ground (which is the very same tile your character is standing on) or in your hand(s). Some ingredients/items like liquids and powders *must be hand held* in order to be recognized. Stacking works fine for combining individual items, however combining smaller stacks into larger ones requires 1 more item than the number needed. While 4 single items can make exactly a stack of 4, combining a stack of 2 with two additional stray singles, requires yet one more to make the stack of 4. This affects both the Stacking reactions themselves and other reactions like brewing which also suffer from the stacking bug. 2b. Material type of stack is determined by the first reagent selected. This is just a thing you live with or use to your advantage. Really minor. -Any reaction asking for "small rock" is asking for a type of small rock/stone found on or adjacent to any pebble tile. -Any reaction asking for "powder" is asking for a powder found on or adjacent to any soil tile. You may need to scroll through the (g)et menu for access to either of the above. It bears repeating, any powder *must be hand held* in order to be recognized for use. -Any reaction asking for "Rock" (only metal industry) is asking for a glob. You will know the nature of this item as it is not defined beyond metal type. If you melt down an iron dagger, it initially becomes "a molten iron", and then after cooling, just "a iron" which in either case, because of material type is considered a glob. -Any reaction asking for "plant" is asking for a plant. You cannot harvest plants in Adventure Mode, but you can find them in bags located in settlements (hamlets, hillocks, etc). -Any reaction asking for "leaf" or "plant leaf" is asking for a plant growth. These (some dependent on season) can be picked by being on or adjacent to any crop or shrub tile and can also be found in bags located in settlements (hamlets, hillocks, etc). -Any reaction asking for "fish" is asking for a non-butcherable critter that is considered vermin like cave lobster. 4. Workshops in fort mode served as a shorthand for the processes and the equipment needed to create a product. Here the workshop's been replaced with tools. You'll need the following in order to make clothes: Sewing needle, thimble, eyelet awl, shears. Everything can be made of bone (bonecarving), metal (metalsmith), wood (woodcrafter). Weaving thread into cloth requires building a loom. You'll need the following in order to make clothes: Two knitting needles, shears. Everything can be made of bone (bonecarving), metal (metalsmith), wood (woodcrafter). Spinning wool/hair into yarn requires building a spinning wheel. You'll need the following in order to make clothes/equipment: Edged tool, sewing needle, leatherworker's awl, pincers. Everything can be made of bone (bonecarving) or metal (metalsmith). Wood (woodcrafter) excludes the leatherworker's awl. You'll need the following items/tools for metalwork: Hammer, tongs, leather item, anvil. You'll need the following items/tools to process logs into the necessary component parts, and for carpentry: Maul (any material type), wedges, saw, froe, drawknife, plane, hammer. 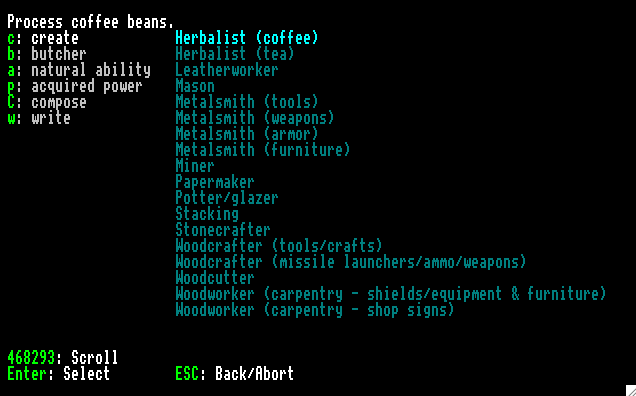 All of these items can be made in either the stonecrafter/woodcutter's menu for ease of access. They can also be forged. 5. Anything involving glassmaking/metalsmithing will require converting a log into small coal rocks (look under Farmer's or Furnace Operator menu). 6. Alteration/repair reactions will resize items to your adventurer. Alteration/repair reactions will always remove item quality modifiers as no skill token is attached to those reactions. This way you can't endlessly alter/repair an item into a masterwork. You can of course add a skill token in, if you do want to Monty Haul your items into masterworks. a. first press the keys "control" + "r" to begin the recording. b. precisely enter the keystrokes for the action(s) you wish to record. c. again press the keys "control" + "r" to end the recording. d. press the keys "control" + "u" to enter the number of times you'd like the recording to repeat (1-99). e. press the keys "control" + "p" to play the macro. +Elves use metal weapons and armor. +All major entities (dwarf/elf/human/goblin) have access to all weapon types as NPC inventories are governed by entity permissions. Often an NPC lasher/bowman/pikeman/etc. would spawn at a hillock equipped with 2 shields. This addresses that issue. +Civilian dwarves, elves and goblins now carry knives. This works well for Adventure Mode, but less so for Fort Mode. Your starting 7 will litter the embark with the knives they carried. +Padded armor (what would be considered a gambeson/jack/aketon depending on period) was added under the generic name "padded (material type) coat/tunic" in keeping with vanilla's nicely flat naming convention (braies and chausses exempt). +Certain smaller birds, when butchered, drop feathers. +Certain critters (wolves, bears), when butchered, drop fur. This is great, so far, but I seem to be having trouble getting the game to detect that my rhino bone leatherworker's awl is an awl while trying to make a leather waterskin. Just rechecked the raws and the reaction does work. I assumed I had mucked it up. So when you're making the waterskin, the first thing you get asked for is any sharp tool. I'm guessing(?) you're selecting the leatherworker's awl at that point, and I'm presuming you only have one of those, because now the reaction's taken that out as a choice by step 4 which is where you need it to be recognized as the awl. First step is sharp tool. Here I'd use a weapon or something like that. Second step asks for the sewing needle. Third step for the pincers. Fourth step, it now asked for the leatherworker's awl. And if you only have one of those, it needs to be unoccupied. So yeah, that's happened to me too many a few times, in which I'd use the leatherworker's awl by mistake as the first step and then it'd be gone for step 4. Hope that helps. I mean I think that's what's going on. Just uploaded a new zip. Made a quality of life change to the Leatherworker Reaction. I replaced the generic edge tool requirement with shears. This way the reaction will ask for specific items, eliminating the potential for mix-up. Why I never did this before while I was fully muddled is one of those things. So just copy over the new files. You won't need to regen your world as I didn't make any significant change. Fixed a bug involving clubs (see changelog). It's minor, but might have been fun if your character was a giant, as clubs weighed 70r or so before the fix. No need to regen the world you're in. Just copy over the files, unless you like 70r clubs. Made/(remade) a change to subterranean animal peoples. Reverted them back to wooden weapons. Clubs back to 9K size and wood material. No need to regen the world you're in. Just copy over the files. In Adventure Mode, when crafting, the game only recognized ingredients/items if they are either on the ground (which is the very same tile your character is standing on) or in your hand(s). Some ingredients/items like liquids and powders *must be hand held* in order to be recognized. A good example of this is soap making. To make soap, you need 3 items: tallow, lye (a liquid), and a bucket. If you just used the Make Lye reaction, that lye is sitting in that very bucket. So to make the game recognize that you actually do have all 3 things, they all need to be on the ground or in your hands. In this case this means putting the bucket on the ground and then taking the lye out of the bucket so it is in your hand. 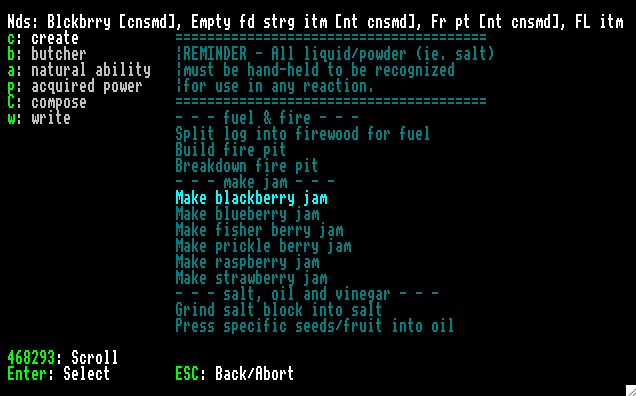 The Readme.txt was also updated to help people make sense of brewing. New zip uploaded. Just replace your old files. If you notice anything weird or wonky, please post. Thanks! New Version 0.1b.0 zip uploaded. Requires new world gen to activate. -Can find daggers in fortress warehouses/depots, meadhalls and camps, as each entity was given the dagger token. -Modded in backstrap looms for the traveler who wants weave thread to cloth. I kinda dreaded warp-weighted loom construction as a traveler. -And lastly but most importantly, expanded bonecarving to allow jewelry to be made from horn and tooth. I came for the LNP, I stayed for the RTDs. In the end, the winner is the one with the most snake venom. Enjoying this mod quite a bit so far! I'm playing an alligator man who wears bone and leather armor. However, I'd really like to be able to make him a sword fit for his stature, and I can't figure out how to make tongs and a hammer. So if you haven't already done so, you'll need to gather 21 rocks to make 21 rock blocks. A rock block is any rock + dirt/sand. You need 10 to make a wood furnace and 10 for the blast furnace. You can do this under the Mason's menu. The wood furnace is needed to make refined coal to power the blast furnace. Now you can work from the Furnace Operator's menu. On the same tile as the wood furnace, drop a log, and 1 unit of firewood. You can cut a branch to make firewood. This would be the 3rd reaction in Furnace Operator's menu. Log becomes bar of coal. Now drop the bar of refined coal onto the same tile as the blast furnace along with 2 leather gloves/mittens. Now you're ready to smelt some metal object into metal bars. I had you collect 21 rocks to make 21 rock blocks because the last stone block + a helve will make a stone hammer (under the Stonecrafter's menu). You can drop the stone hammer onto the same tile as the blast furnace. Now in the Metalsmith (tools) menu, you'll make first a metal hammer, followed by the tongs. With that, you're ready to go. Thank you for the answer. Metal industry, here I come! It's too bad gauntlets are bugged! I predict lost fingers are in the future of my poor alligator man. Yeah, it's a shame gloves and mittens are set as left or right as opposed to how shoes and boots are configured. My characters tend to hoard gloves and mittens as those suffer plenty of wear due to accumulating ticks counts during slow travel mode. It's sad, but not unexpected.